Proprietism is based on the premise that a network of for-profit entities, each with unlimited liability, is the most efficient and welfare-generating form of human organization. The posts on this blog provide rationalist support for this notion (while the support for the movement of proprietism within society is empirical). Below is an abstract analysis that marries classical economics and proprietism. The proprietist theory uses microeconomic theory terminology within the IPO model. An IPO model is very simple: it is a system that inputs a resource, transforms that resource in its processor, and outputs that resource. 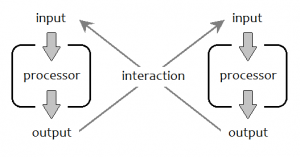 When two systems interact, the output of one system becomes the input of another system. In microeconomic theory, a firm has inputs to production K for capital and L for labor, and the cost of capital and labor are represented as C(K, L). The firm produces a product X, and earns total revenue from the sale of X, represented as TR. Logically integrating this terminology into an IPO model, K, L, and TR are inputs to the system, C(K, L) and X are outputs to the system. Total sales revenue enters the firm as a monetary input, and is retained as profit or leaves the system as the monetary outputs C(K, L), which are exchanged with a supplier for the resource inputs capital and labor, which are then produced into the resource output good X, which is then exchanged in a transaction with a buyer system for money, which reenters the system as total sales revenue. Expanding this model, we can visualize the roles of traditional departments within a firm. We can similarly use microeconomic theory to apply this model to the consumer/worker. A consumer system inputs money as income M, which he saves or outputs as money paid in exchange for the resource inputs good X and Y, which sustain and support the consumer system, allowing him to output labor, for which he gets paid an income M.
For the independent contractor, the self and business have merged into one. His goods and services are his inputs to production, which create his brand and motivate him to work. His work is his product, his income is his revenue, his savings are his profit, and the price he pays for goods are his costs. In an economy of sole-proprietors, there is a paradigm shift for the structure of businesses and industries. The model implies that an individual’s customers are his employer, on the grounds that he is providing them his labor service in exchange for their payment. Likewise, an individual’s subordinates are like suppliers in that the individual is paying them in exchange for the service they provide. This entry was posted in Uncategorized on 9 April, 2014 by Paul. The directors of such [joint-stock] companies, however, being the managers rather of other’s people’s money than of their own, it cannot be well expected, that they should watch over it with the same anxious vigilance with which the partners in a private copartnery frequently watch over their own. Certain forms of organization, like corporations and limited-liability partnerships, represent an ancient problem that has vexed scholars from Adam Smith to Michael Jensen: it is the problem of the separation of risk-bearing owners of an organization, and the controllers of that organization. In other words, how can a principal (the owner of an operation) ensure that an agent (the one tasked with executing and managing the operation) will have the incentive to perform in such a way that maximizes the interests of the principal? The classic and most studied example of a principal-agent relationship would be that of the shareholders (principal) and the CEO or president (agent) of a corporation. However, the principal-agent problem can take many different forms. For example, a principal might be the manager of a retail store who has her own set of goals and budget constraints, and she wants to make sure that the agents, the sales associates working the floor, have the incentive to behave in line with those goals and budget constraints. 2. bound by a behavior based contract (he is compensated based on his behavior despite the results), with sufficient information systems in place to keep track of the agent’s behavior. The interesting impact of the information age on agency theory would therefore be that as the cost of information and information systems approaches zero (like an open-source business software), we will see increasingly more situations in which a behavior-based contract would be inexpensive, effective, and appropriate. For a great analysis on how and why bits will continue to approach free, checkout Free: The Future of a Radical Price by Chris Anderson. This suggests that in the future, as the movement of proprietism becomes more widespread, the workers who will excel will be those who get results, and those who are good at documenting their behavior. In searching for a theory of organizations, business academics have noted that such a theory would be likely to be based out of agency theory in some capacity. In Theory of the Firm: Managerial Behavior, Agency Costs, and Ownership Structure (1976), Michael Jensen and William Meckling noted that traditional economic theory often treats the firm as a “black box,” and makes the mistake of personifying it. They point out that a company, like an industry, is a complex system of independent agents with different and often conflicting interests, and while we would never make the mistake of attributing feelings and motives to an entire industry, we do so often when we describe the behavior of a company. They conclude that an organization is not a self-contained entity with personal motives but is in fact a “legal fiction… which serve[s] as a nexus for a set of contracting relationships among individuals.” In other words, the world is not a clumsily stacked pile of institutions, but rather a complex network of people, connected by relationships and contracts. 3. our sales team (who are mostly employed by my company but some are contractors). I have a much more intimate relationships with many of these non-employees than I do with employees of my company who work in other departments and business units. 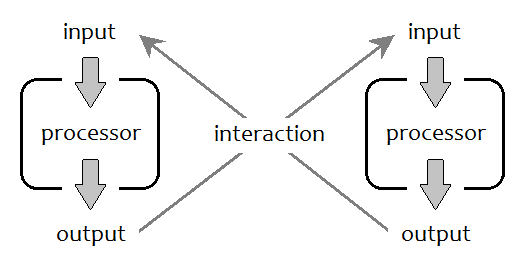 This “fuzzy” view of people, relationships, organizations, industries, sectors, and society is inherent in proprietism, because proprietism is a system born from the idea that business is a network of independent people working together with common goals, rather than blocks of companies that buy, sell, and compete. Kim has a business idea, and she needs to raise capital in order to produce her widgets. She uses sites like Upstart, Angel List, Kickstarter, and Y Combinator to interest investors and raise capital. Kim will present her operation and strategy to her investors, and share detailed projections of sales and how sales will correspond to investors’ ROI. Let’s say that Kim raises $1 million, expects her operation to cost $900,000 in its first year with sales of $1.15 million. She agreed to only take home 20% of profit the first year, so she will earn $50,000, and the owner’s equity is the balance of $200,000. Kim enters a contract with Michelle as an information systems administrator for the operation with a yearly salary of $100,000. This salary is above the market value for someone with Michelle’s skill level, but it includes the cost of purchasing and implementing information systems for Kim’s widget operation. This of course gives Michelle the incentive to manage the $100,000 budget like her own money, which it essentially is because she takes home what she does not spend. In a similar manner, Kim contracts with Roger, a widget production professional, with a salary of $900,000. The production of widgets is roughly estimated to be $800,000 for the first year: $300,000 in equipment, $400,000 in raw materials, and $100,000 for 2 laborers and a supervisor. This leaves Roger $100,000 if he finishes the year as budgeted, and creates incentive for him to minimize waste and stay creative. In many ways, this example is similar to prevailing corporate structures: capital is raised, equity is grown, managers oversee aspects of an operation, a clear reporting structure is in place, etc. What’s different is the incentive structure for Kim, Michelle, and Roger, as well as the relationship between Kim and her investors. Rather than investing in a widget operation, the investors are investing in Kim as a person. Likewise, Kim has worked out contracts with Michelle and Roger based on her preconceived notions of their ability to deliver. The weakness in this proprietist-style venture is that it lacks the advantage of investors’ limited liability in the operation. In an earlier post I discussed that the theorized advantage to limiting liability is that it increases the incentive to invest. I also discussed that this advantage merely compensates for our culture’s tendency to sue. An alternative method of protecting investors could be insurance plans that still provide incentive for entrepreneurs like Kim to not fail, yet ease the investors into enthusiastically providing capital for the operation. Despite this shortcoming, this model is the beginning of a legitimate alternative to the traditional corporate structure, and one that is a better fit for a society in which information systems are inexpensive and ubiquitous, and for a culture that honors individuality and relationships.